Yesterday I had the pleasure of meeting with Christine Russell (left) of 889 Yoga. Since taking the plunge into the world of entrepreneurship two years ago I’ve had the opportunity to meet with some of Toronto’s best fitness and business minds. My meeting Christine yesterday was so inspirational that I thought I would share some of the highlights with you. She is a beautiful person from the inside out! The Russell sisters are in their late 20s and they are a true Toronto success story. They started 889 Yoga in 2007 and haven’t slowed down since! 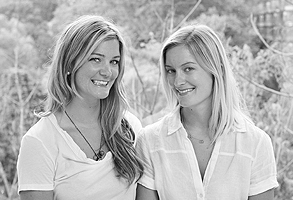 With a partnership with The Thompson Hotel and a bustling wellness practice there is no stopping these two ladies! Christine’s top piece of advice for me – someone new to the fitness world, was that everyone is going to have an opinion and in some way they are going to tell you that your plan will be impossible to achieve. Christine advised me to stay true to what I do best and do that really well. At 889 Yoga they just passed their 5 year anniversary – proving any of their doubters absolutely wrong! After meeting Christine and seeing their successes firsthand it re-confirmed for me that when you follow your passion and you set out to be the best at what you do, and do it well, there’s absolutely no stopping your potential. The importance of flexibility was also stressed by Christine, and not just in the yoga sense of the word! This is something that absolutely rang true for me. When you have your own business you need to constantly be adapting and open to change. Eight months ago I never would have thought that my business would have been going in this direction, but I’m so happy with it! I’ve learned to really slow down and figure out what’s right long term. I’m the type of person that likes to dream big, and dream up more from there! Seems like that philosophy worked for the Russell sisters, so I’m going to keep on dreaming big! Lastly it’s just really nice to see really nice people doing really well! Many of my serious yogi friends tout 889 Yoga as the absolute best in the city, top instructors in a beautiful facility. I will certainly be signing up for some much needed zen asap! Hope to see you beauties and bodies there!